Formatting is very simple, but if you’re not familiar with MS Word, I’d suggest “playing around” with all its functions or taking a class to learn it better before you begin hacking your or someone else’s book to pieces. I’ve been working with word processing programs for the better part of 20 years and most of my computer knowledge is self-taught. 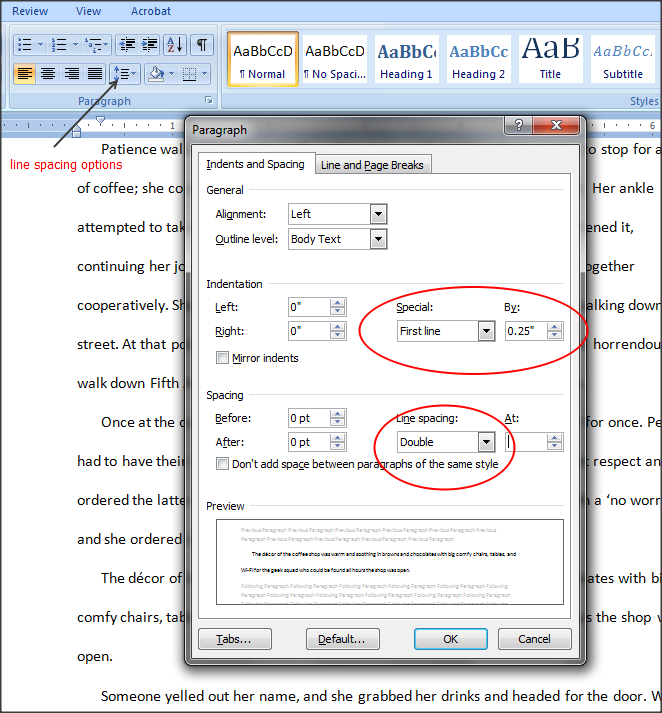 I’ve helped others format their books before and thought it might be a good idea to share exactly how to do so because I’ve met several writers who don’t know MS Word all that well. In fact, I’ve had to teach several of my writer friends how to use Track Changes. What’s that, you say? 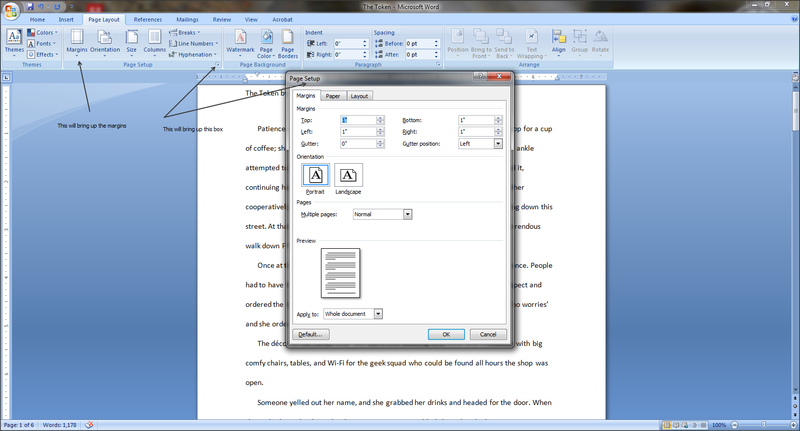 It’s a nifty little editing function in MS Word that you should learn to use because your editor will likely use it. You can find my lesson for Track Changes here. We’ll cover the first of two different types of formatting in this post: formatting your manuscript (MS) for agents/publishers, with formatting your book for independent publishing to follow in a separate post. 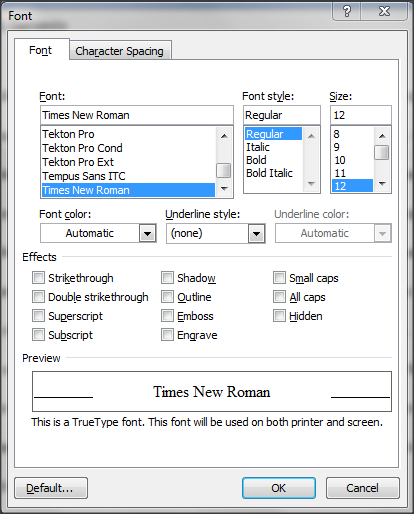 Microsoft Word has a default (which you can actually change and I’ll show you how) that includes the “style” as Normal, set in Times New Roman font (most likely) at 12pt font (very common across the board). Most of you probably don’t even understand what the ‘pt’ in 12pt font means. As one who trained in graphic design, I’ll tell you. It means point, that the font or type is set at 12 points. A point is a measure, like inches or centimeters—closer to centimeters, actually. In graphic design, we use point and pica. To reset or change the default for fonts, click on this little box in the corner, or press CTRL + D. Make your changes. For instance, I have mine set at Calibri regular 12 pt font. I just like it that way. Click on ‘Default’ and then ‘Yes’ to make the changes permanent. Your margins should always be 1 inch all the way around. You can adjust/check this under the ‘Page Layout’ tab, under ‘Margins’, as show below. Just click that top arrow and drag to the half inch (.5) margin. Any time you hit ‘Enter’ after that, it will automatically adjust the indent. I prefer 0.25″ instead, especially once the book is ready to publish. A half inch indent looks horrible in a published book. Be sure that your text is aligned Left and not Justified. To adjust Line Spacing and Indentation, click on the icon in the image and Line Spacing Options. 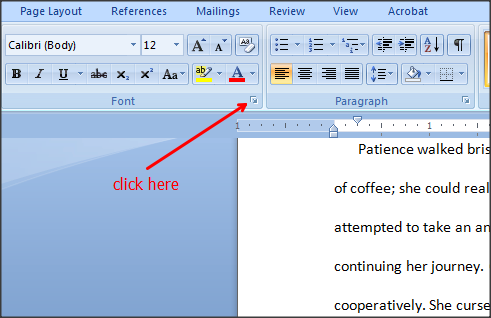 You’ll notice that here you can also adjust the indentation for your entire document, as well as change the spacing (i.e. single space, double space) of your MS. When you do adjust your indentation, be sure that afterward any chapter breaks (e.g. Chapter One, or a subtitle) or asterisks (for a scene/time change), etc. are centered from the left margin and not the FLI. So, you’ve got your margins set, your indentation, your font style and size, your spacing, etc. For agents and editors, always double space. Think of them as you would your college professors. This should pretty much set your MS for agents and publishers. Any other issues regarding this part, we can address in the comments below. Soon, we’ll learn how to format your book for independent publishing in Formatting 102. Previous postBack in the Swing of Things?